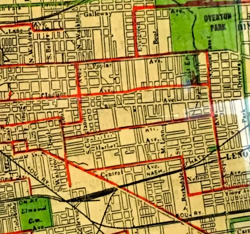 When the residents of Central Gardens organized their neighborhood association in 1967, the neighborhood’s footprint and street grid were already well established. 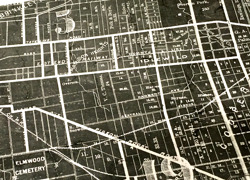 One has to travel back sixty to seventy years prior to that landmark year to discover how its layout and its proximity to Downtown Memphis made this neighborhood unique. Prior to 1900 the land now occupied by stately mansions and pastoral avenues was not yet within Memphis city limits - up until 1899 the city limits stopped at what is now Dunlap Street in the Medical District - and the land, mostly undeveloped and still densely forested, was still owned by families with familiar names like Overton, Hewitt, Harbert and, predominantly, Rozelle. From Central Gardens - Stories of a Neighborhood: “Solomon Rozelle had settled in Shelby County in 1815 on 1600 acres of wooded wilderness,” and his estate’s land sat between present-day Bellevue to the west all the way along Union Avenue and to East Parkway. It is said that Rozelle’s slaves, who along with his family cleared the wooded land, were the first African Americans in Shelby County. Along mostly unpaved and graveled roads the open spaces east of Cleveland Street and south of Union Avenue were a relatively short one-hour commute from Downtown by horse and carriage, and the streetcars from Vance and along Peabody and Central avenues took more and more visitors and residents away from Downtown and into the newly subdivided land to the east, which was quickly being sold off by landowners. These rather distinguished beginnings established the rich heritage that is the Gardens today and provided the foundations of what would one day become the Central Gardens Neighborhood Association. Copies of Barbara Viser’s Central Gardens - Stories of a Neighborhood can be purchased here.